As part of the improvements added to Configuration Manager Technical Preview 1802 the product team have added a new report. This report is named “Windows 10 Servicing details for a specific collection” and as the name suggests it reports on the servicing state for a collection containing Windows 10 devices. To run this you will need to go to the Monitoring workspace as usual and browse to Reporting. From here you can either search for the name of the report or alternatively browse to the Operating Systems reporting sub-folder and you can run it from there. Remember you can also set up subscriptions to these reports as required. 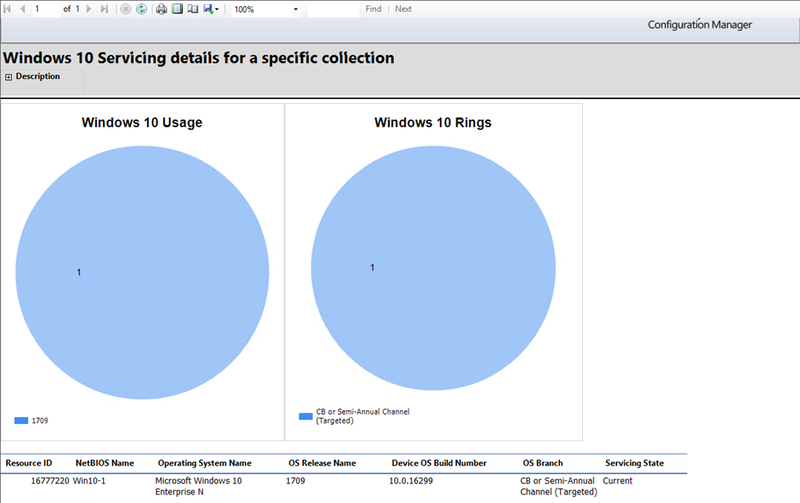 You need to provide a single collection for this report and it will tell you the Windows 10 versions across that collection and also which servicing rings are used. With this in mind you’ll probably want to run his report across a high level collection such as all Windows 10 devices. This screenshot is from my lab with only a single client at the moment but it should give you an idea of the look and feel of the new report. NOTE: In my lab I had errors when running this report due to permissions access to one of the views. I got around this by temporarily amending the permissions in SQL for my SQL reporting services point account to sysadmin. I’m sure in future releases this little bug will be resolved.